Empty beaches, like this one in Biloxi, Mississippi, are not uncommon along the Gulf Coast as cleanup operations continue. 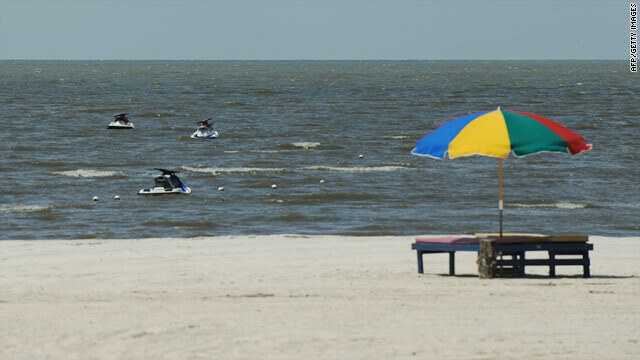 (CNN) -- Apprehension mingles with optimism in touristy beach towns along the Alabama and Florida Gulf Coast as a vast oil slick looms offshore. "Residents here are living in fear. There's a distinct somberness in everyone I talk to," said CNN iReporter Kelly Reynolds of Destin, Florida. A time-share condominium receptionist got tears in her eyes when Reynolds asked her how reservations are doing, he said. She told him people are calling to cancel their reservations, not only in the coming weeks, but for months ahead, he said. "She knows her job may be in danger. If the oil comes to these beaches, people won't come to the beaches, and it will deeply affect our economy," said Reynolds, who owns a window-covering business and has lived in Destin for 35 years. "The oil is sitting out there, like a ticking time bomb. We don't know when it will reach our beaches, but it will hit our shores. And its impact will be generational." Myke Triebold, an iReporter and real estate agent in Niceville, Florida, across a bridge from Destin, prefers to walk on the sunny side of the street. "Certainly, given the amount of oil that's being dumped into the Gulf on a daily basis, we're all kind of holding our breath as to what's going to be down the road. It could be grim," she acknowledged. "But for right now, I think the important thing to keep our economy going is to let people know that if you have plans in Destin, come ahead, because it's beautiful, absolutely beautiful. The water's clear, it's clean, it's blue. I can stand in the water up to my chest and look at my toes, and there's no oil hitting me." In Gulf Shores, Alabama, 72 miles to the west, The Hangout Music Festival gets under way on the beach at noon Friday and will run through the weekend. The festival -- featuring such major acts as John Legend, Gov't Mule, Alison Krauss, the Zac Brown Band, the Black Crowes and more -- will be a hub of environmental activism, as organizers ask attendees to donate animal rescue supplies, use bicycles or public transportation to get there, and write letters to Congress about shoreline preservation. Shaul Zislin, owner of The Hangout restaurant, says all proceeds will go to groups involved in coastal protection and restoration. "You come in, you'll enjoy a wonderfully produced event, and at the same time you know that the profits will come back to this community, the Gulf," Zislin told CNN affiliate WEAR-TV. Beach visitor Gaines Drago said the festival is right on time. "Many of my own personal friends are involved in the tourism industry down here, along with the seafood industry, and I think if people give it a chance, quit reading into the hysteria, they'd see we're not shut down," Drago told WEAR-TV. Triebold said the difference in outlook is a matter of "choosing whether your glass is half full or half empty." "I try to deal with today and do what I can to make it right. And the things that I can't control, I can't control," she said. "Tomorrow may never come, so I'm not going to spend all my energy worrying." CNN iReport's Tyson Wheatley contributed to this report.